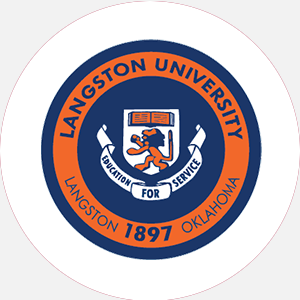 Langston University (LU) is a four-year, state-supported, coed, liberal arts institution founded in …. Langston University (LU) is a four-year, state-supported, coed, liberal arts institution founded in 1897 as the Colored Agricultural and Normal University, for the purpose of instructing men and women of color in the agricultural, mechanical, and industrial arts. Within a year, following the territorial act that established the college, black settlers determined to provide higher education for their children raised enough money through auctions, bake sales, and donations to purchase the 40 acres of land on which the school was built. The first bachelor’s degree was awarded in 1901. The first president, Dr. Inman E. Page, was the son of a former slave. The school adopted its present name, Langston University, in 1941. After the Civil Rights Act of 1954, many black students in Oklahoma began to attend colleges other than Langston University. President Hale created a ten-year improvement plan to attract both black and white students to the University. Urban centers were instituted in Tulsa and Oklahoma City. These innovations caused an increase in enrollment and a student body that is now approximately 70 percent black and 30 percent white, with students coming from twenty-six states and eighteen foreign countries. In 1987, Langston University began planning its first graduate program. Langston University is Oklahoma’s only historically black college. It serves a double mission as a land grant institution and an urban center for the state. The original mission to carry out agricultural research and cooperative extension continues. Enrollment and programs for urban residents also continue to grow. The University is acclaimed both nationally and internationally for its research projects in the soils, grains, and water of Oklahoma. The American Institute of Goat Research has received international acclaim and has given an added dimension to the cooperative research. Located on 440 acres of land, the University renovated several of its buildings, including the former president’s home (White House); the student union; and the library, the architectural focal point of the campus. Langston is accredited by the North Central Association of Colleges and Schools to award the Associate of Science, Bachelor of Arts, Bachelor of Science, and master’s degrees. Graduation from an accredited high school (or equivalent) with the following units: 4 English (grammar, composition, literature), 2 lab science (biology, chemistry, or physics), 3 mathematics (algebra I and II and geometry, trigonometry, math analysis, or calculus), and 2 history including 1 unit of American history, and 1 unit citizenship skills (economics, geography, government, or non-Western culture) and 3 additional units (computer science, foreign language). The school recommends an additional 2 units in fine arts, music, art, drama, or speech. Admission Application Deadline: July 15 (priority) Admission Contact: Director of Admissions, Langston University, PO Box 838, Langston, Oklahoma 73050; Telephone: 405-466-3231; 405-466-2966 (fax). A minimum of 60 semester hours for an associate degree; a minimum of 124 semester hours for a bachelor’s degree and completion of core requirements; at least 45 of total credit hours must be at the senior college level; a minimum of 30 semester hours must be earned at Langston University; a minimum 2.0 GPA is required for graduation; must complete required courses in major and minor with a “C” or better; an internship or field study must be completed; 3 hours in American history and 3 hours in American government are mandated. Campus Regulations: Cars permitted without restrictions; quiet hours; dorm visitation 6–11 p.m. Campus Services: Health center, personal and psychological counseling, tutoring, and religious services. Campus Activities: Social and cultural activities include theater, band, dances, movies, and forums. Each year LU brings in renowned artists in serious music, dance, and theater. Students are involved in community service projects. Students may get involved in the Langston Gazette (student paper). Communication majors or volunteers may work at the KALU-FM radio station. Leadership opportunities are found in the Student Government Association (SGA), departmental clubs, and special interest groups. Greek sororities include Alpha Kappa Alpha, Delta Sigma Theta, Sigma Gamma Rho, and Zeta Phi Beta; fraternities include Alpha Phi Alpha, Kappa Alpha Psi, Omega Psi Phi, and Phi Beta Kappa. Housing Availability: Approximately 1,700 housing spaces. August-May 12 (semesters) Commencement and conferring of degrees: May One summer session.